Easy-to-use straps deliver a safe, and cute method of attaching baby’s beloved toys and teething rings, so they are always close-by. No more worries with dropping or losing your little one’s pacifier, the Secure-A-Toy ensures it’s always near them. Easily adjust the length to shorten or lengthen the reach for a toy. This essential travel accessory for infants and toddlers is great for car seats, strollers, and high chairs. Easy to clean, as it is machine washable and comes in an assortment of colors. 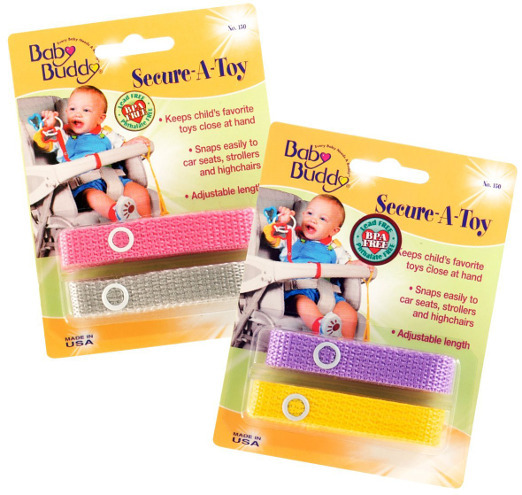 The Secure-A-Toy is MADE IN USA and is always manufactured with BPA free materials.